Why I want to read it: I have read several of the author's Mercy Thompson books, which I have loved. I purchased a copy of this book several years ago as a result. I want to read everything Patricia Briggs has written. Peony-s mother is against her daughter-s attending the production: -Unmarried girls should not be seen in public.- But Peony-s father assures his wife that proprieties will be maintained, and that the women will watch the opera from behind a screen. Yet through its cracks, Peony catches sight of an elegant, handsome man with hair as black as a cave-and is immediately overcome with emotion. 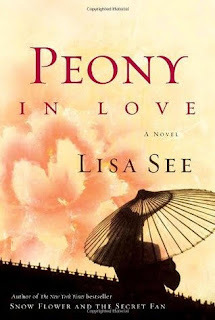 So begins Peony-s unforgettable journey of love and destiny, desire and sorrow-as Lisa See-s haunting new novel, based on actual historical events, takes readers back to seventeenth-century China, after the Manchus seize power and the Ming dynasty is crushed. Why I want to read it: Lisa See is one of my favorite authors, but I haven't quite read all her books yet. I am trying though! One I haven't read yet is Peony in Love, which I really must get to. Why I want to read it: I really enjoyed the first book in this series and am anxious to continue with it. I just love Camilla and Lena. Spending time with them is like visiting with old friends. Why I want to read it: This mystery set in Victorian times about a woman with nontraditional interests is calling my name quite loudly. Can you hear it? Do these sound like something you would be interested in reading? I really like the cover of Peony in Love. Then again, I'm a huge sucker for anything flower related. I also feel like I would like to read The Butterfly Conspiracy as well. They seem so interesting! Elle - I like the cover of Peony in Love too. :-) I hope both books will be good when I get to them! I like the Mercy Thompson series, though I've missed a great chunk of the books. A Dark and Twisted Path sounds wonderful - I hope you get a chance to tuck into all these reads, Wendy. Have a great week! Sarah - I am far from being caught up with the Mercy Thompson series. It's been too long since I last read one. I love the Buckley series and can't wait to read more. Hopefully one of these days! I've heard the Alpha and Omega stories are good too, especially if you like Mercy thompson. A Dark and Twisting Path looks great too! Greg - I hope the Alpha and Omega books are just as good. I really enjoy the Mercy Thompson series. Patricia Briggs is author I have really wanted to try. Great picks. Both of your new choices are appealing to me. I'm adding them to my wish list. Catherine - I hope you like them if you read them, Catherine! Oh, you've got a good group of books here! 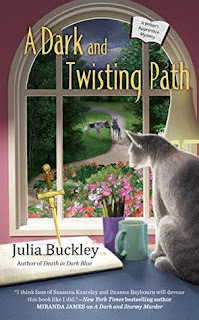 I've meant to try Julia Buckley's series. It's up to #3 already? Got to get moving on it. I've really enjoyed many of Lisa See's books too. Nice picks, Wendy! Kay - Thank you! I am looking forward to reading all of these--eventually. The Buckley series is a good one! Oooh! I need to get back to reading Patricia Briggs' books soon! Great picks! Ronyell - Me too! It's been too long since I last read one of her books. I need to read more Lisa See for sure. Kathy - I do too! I've read most of her books, but not all yet. 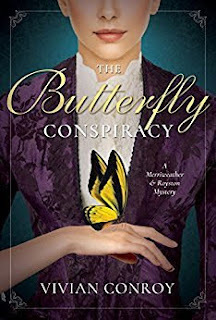 Like you The Butterfly Conspiracy sounds right up my alley! Have you read the Stoker and Holmes series by Colleen Gleason? Anna - Doesn't it sound great? I haven't read the Stoker and Holmes series by Gleason, but I want to. I've read some of her other books and really enjoyed them. Another vote for The Butterfly Conspiracy. I'm a fan of Victorian settings. Lots of great picks this week. I hope you get a chance to read them! Mary - Thank you! I hope I will too! I have an arc of Butterfly Conspiracy so I guess you could say I'm excited for it. I grabbed it because of the setting as well. 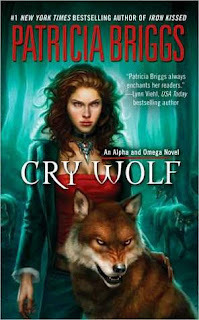 I LOVE LOVE LOVE that cover of Cry Wolf, but then I don't recall finding a Briggs cover I don't like! Great picks! I especially find myself drawn to the Patricia Briggs and The Dark and Twisting Path. Hope you enjoy them all. I love the look of Cry Wolf, I've not read that series! She's a great author though. Sassy Brit - I do love her Mercy Thompson series! The Butterfly Conspiracy sounds good and I really need to try Lisa See's books. Cry Wolf is book two just in case you didn't realize and does better if this series is read in order after the prequel novella and book one. Love the series as much as the Mercy Thompsons. Sophia Rose - Lisa See is one of my favorite authors. I just love her books. I will look for the prequel novella for the Alpha and Omega series. Thanks for the head's up. Stephanie Jane - Snow Flower and the Secret Fan is one of my favorite novels. I just love Lisa See's books. Whoah....you haven't read Cry Wolf yet? You need to get busy :) There is a prequel novella that comes before this book that really sets this book up. I would recommend you start with the novella, Alpha & Omega. I hope you enjoy all of these when you get the chance to read them. Carole - It's hard to believe isn't it? I do need to get busy! :-) Thank you for the recommendation to start with the novella.I am off to get it! Naida - You have to give Patricia Briggs a try! I waited a long time to do so. Now I just need to get back to her books. I haven't read any of these yet, the old or the new, but they all sound wonderful. The Butterfly Conspiracy is definitely calling to me too. I love books that feature women who are ahead of their time in terms of what society expects of them. Suzanne - Thank you! I enjoy books featuring women ahead of their time too. The Butterfly Conspiracy should be good!